"In witness thereof the seal of the Association has been affixed this 12th day of September, 1956." So states our charter officially designating us a branch in good standing of the American Association of University Women. The purpose of this branch, as stated in our bylaws, "is to unite the alumnae of colleges and universities, which have been approved by the American Association of University Women, for practical education work: to concentrate and increase their influence in the community for the solution of social and civic problems: to participate in the development and promotion of the policies and programs of AAUW; to contribute to its growth and influence, and to cooperate in its state division and regional work." Our first meeting is dated October 3, 1956; fifteen women were present including: Elaine Coate, President , Nancy Wolter (Zimmerman today), Lunetta Headley and Norma Winther who are all still members. We were, at that time young mothers who put our family first but felt caught in the suburban split-level trap. We sought mental stimulation and the support of other women living comparable lives. How exciting it was to read and discuss ideas in study groups dealing with International Relations, Status of Women, The Impact of That New Media--TV, and Education. We read about and researched the pros and cons of day care centers which we decided were not for us!! We worried about how to bring up healthy and “brilliant” children, be wonderful wives and how to have time left over for ourselves. Later as our children entered school we became, not soccer Moms, but PTA junkies wanting to know as much as possible about modern education; the school’s role and ours. We set up community programs dealing with the arts and money management for women. We worked in the local libraries surveying residents in Pennsylvania regarding the starting of new libraries; we helped begin the Friends of Tredyffrin Library and we gave seed money to start the Women’s Resource Center in Wayne, PA. We held annual book sales, a tradition continued to this day. With our children safely launched it was time for us. Many of us became “retreads” returning to school and later joining the work force. Like the National Association our branch has changed as membership needs have changed. In keeping with the AAUW Mission we are mindful of the changing needs of women and girls in terms of equity and lifetime learning. Our heritage is a rich one that has helped many a woman reach her potential; It is now up to us to keep the momentum going for the women of tomorrow. The goal of Let's Read Math™ is to spread a joy for mathematics among children and the adults who care for them - at school, at home, or in various out-of-school settings. Read good children's books with math themes, then do fun math activities related to each book. This is a program begun by AAUW member Claire Passantino. 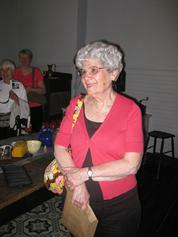 In October 2007, branch member Anne Odenweller attended an AAUW presentation about Let’s Read Math in Reading, PA. Program VP Karen Wellin put together a committee of six AAUW branch members and during 2009-2010 worked with girls in grades K-4 as part of a new after school program being run by St. David’s Church and St. Augustine Academy in Norristown, PA. We did one workshop a week for 8 weeks. In 2011, Eleanor Erskine and Susan Norris ran two workshops but Karen and Pleasants Tinkler's were snowed out! We look forward to working with the Let's Read Math program again. If you are interested in this program, please contact Karen Wellin, jdwellin@earthlink.net. Click HERE to read more about what AAUW is doing with Let’s Read Math.